The members of the Syndicat des travailleuses de CPE de Montréal-Laval, a CSN-affiliated union, voted 92 per cent in favour of the deal during a special general meeting at the Faimount Queen Elizabeth Hotel Wednesday night. 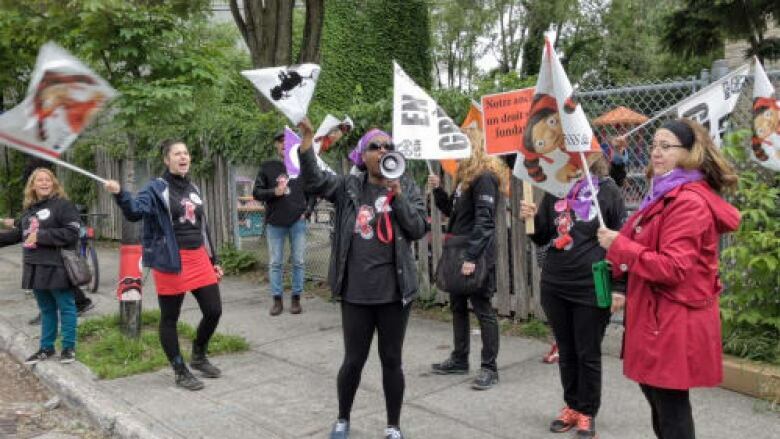 Daycare workers in Montreal and Laval have ratified a deal to end months of labour strife, days after a strike that left thousands of parents without child care was called off. Nathalie Fontaine, who was part of the union's negotiating committee, said she believes members made gains on a number of contentious points. "We are extremely proud of the result. The bargaining committee has given it their all since talks began last October," she said. The workers' main concerns were related to scheduling, seniority and working conditions. ​They have been without a collective agreement since March 2015, and held multiple one-day strikes over the past several months. On June 6, more than 1,300 of them walked off the job in an open-ended strike that lasted eight work days, leaving the parents of about 3,000 children looking for alternative child care. Last Sunday, after the union and the group representing their employers, the Association patronale nationale des CPE, had spent 24 hours at the negotiating table, a mediator from the Labour Ministry proposed a deal that prompted the union to call off the strike. Once it is signed, the new collective agreement is expected to be in effect until March 31, 2020.